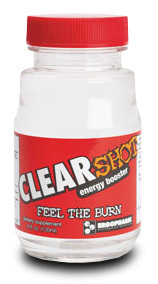 Clearshot is a next-generation energy drink with powerful neuro-stimulating and endurance enhancing properties. Powered by Geranamine™, the GC Neuro-Stimulant Blend produces a supercharged yet prolonged energy, which, when felt in combination with the intense thermogenic heat induced by Ginger- Derived Thermogenic Spice, produces an incredible feeling that must be felt to be believed. In addition, a solid 3 grams of Citrulline Malate is included to combat muscular fatigue, thereby increasing muscular endurance and recovery. If you're looking to increase performance (at the gym, at work, or out on the town), this is the energy drink for you. So I opened up the bottle and took smell of it, somewhat strong. I really did not know what to expect since, some people like it others don\'t. My first sip of Clearshot, I can describe like a tangy flavor with a bite to it. When the liquid was going down my throat, I felt a warm tingle (no homo). On my second sip of it, my nostrils cleared up, I was like wow!!! I like this!!! After taking half a bottle(1 serving), the flavor went away. On my second dose about 45 minutes into my workout, the taste became more familiar and tasted better, the zing initially is what wakes me up, followed by the warm feeling down my throat (once again no homo). I pretty much chugged all of the second serving, definitely good!!!!! side note: I know everyone has different taste buds, but seriously guys I really can\'t understand some of you saying it\'s gross. Grow some focking shaved ballz!!!! How do you deal with let\'s say \"Bacardi 151\" or Jack or Tequila from Jose Cuervo???? Do you whine in this same manner? I personally don\'t like these, but man up people!!!! Clearshot does not taste bad at all. After the first serving about 15 minutes later, I got this overwhelming rush of energy and positive anger!!!! The attitude of, \"I want to deadlift\", bring it b*tch!!! ok enough caveman talk. Another feature I noticed is unmatched focus, zone type. I can describe as I don\'t even notice anyone else at the gym, just me and the dumbbells. The endurance was also great, I took less rest times in between my sets, just awesome feeling. So after the second dose of Clearshot, I went for cardio. Again zone feeling, felt like I just started working out, and wanted to go back and lift more. I just ran about 40 minutes, which was double the amount I normally do. After all this I still have energy and typing this review, but I can\'t go to sleep. The ingredients are citrulline malate, which helps with endurance and removing amonia from one\'s body. This is an expensive ingredient, so at 3g it\'s a nice dose of it. The other ingredients are from AMP, which have worked great in the past for me. The ginger I like, gives Clearshot I nice zing to it. The value of this product is for me is worth the $2.70 a bottle. Now if hopefully this product becomes a hit for Patrick, he might be able to sell it in a large plastic jug to lower the price. I am definitely happy I purchased the 12 bottle package, and will purchase this again. However if it would cheaper in the future, I will become an addict."